One of the most memorable images from the Original Star Wars Trilogy is the white skulled foot soldiers of the Empire. Whether for their ominous appearance or their laughable targeting skills, Stormtroopers epitomise the might of the Imperial army. Initial concept sketches produced by the concept artist Ralph McQuarrie were refined and given the rubber stamp of approval by George Lucas in 1975. When preparation to make the movie began in January 1976 it fell to overseas agents of The Star Wars Corporation to source all the necessary supplies. 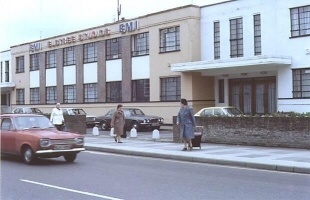 With base camp established at what was then EMI's Elstree Studios George Lucas and company had to rely on the experience of local British film industry workers. Since the 1920s the area of Watford, Borehamwood and Pinewood had long been known as the British Hollywood, with plenty of skilled craftsmen to be hired out for low wages, compared to their US counterparts. At the time the expert in military costume design was John Mollo, who was employed as the chief costume designer on the production. Initially the costume construction came under the remit of the studios own craftsmen, but it became clear that the scale of the production required hundreds of costumes - each more outlandish than the previous - the costumers and seamstresses felt they wouldn't be able to cope. In order to keep the movie on schedule The Star Wars Corporation and Elstree Studios came to an agreement to find alternate sources for many of the costumes. Berman's & Nathan's (now Angel's Fancy Dress) of London, the world famous TV, film & theatrical costumiers, took charge of the numerous military costumes while fabrication of the more difficult Stormtrooper helmets and armour was given over to the studios own plasterers who decided to try their hand at laminating glass-reinforced fibre (aka fibreglass). By the Christmas of 1975 it was clear that the quality of armour being produced was not high enough to meet the necessary standards, and so an increasingly frantic Lucas tasked Mollo with finding an alternative method of fabricating the costumes. One requirement for the Stormtrooper costume that Lucas was critical about was the fact that the traditional method of making body armour (either using beaten metal or plaster of Paris and chicken wire) did not create the illusion of being futuristic. Mollo hit upon the idea of using plastics to get the effect Lucas was looking for, and although plastics had been used for costumes for more than a decade, they were only used for smaller and less complicated pieces. A costume as intricate as a Stormtrooper would require expertise that had not been tapped in the British film industry before. Lucky for Lucas, Mollo had a contact who had experience with a recently developed material that would prove perfect for the job. Andrew Ainsworth, who had recently graduated from Ealing College with qualifications in Industrial Design (along with fellow alumni Freddie Mercury from Queen - whose lead guitarist Brian May is an avid Star Wars collector), had established Shepperton Design Studios in order to produce vacuum-formed car bodies for custom race cars. At the beginning of January in 1976 Mollo approached Shepperton Design Studios with a vague brief - to produce a plastic helmet - and a copy of one of McQuarrie's final proofs. Working from scratch Ainsworth built a clay sculpt of the helmet, broke it up into castable parts and pulled sheets of heated acrylonitrile-butadiene-styrene (ABS) plastic using a vacuum pump. The completed helmet was rushed to Mollo who passed it onto Lucas. So pleased with the job, Lucas requested that Mollo ordered 62 helmets and the body armour suits (56 stunt Stormtroopers and 6 hero Stormtroopers) to go with them. While vac-forming is a common process today, Ainsworth's work in the late 1970s was groundbreaking in material science. In those days all of the forming machines had to be hand built to fit each order but luckily Andrew already had a number of vac-formers of various sizes to suit both short, long, thin and stubby casts. Despite having no experience of working for the film industry before Ainsworth committed Shepperton Design Studios to the task. Working to a frenetic deadline, Ainsworth and a very small team of technicians worked around the clock at their facilities in South London in order to meet the deadline. Eventually Shepperton Design Studios picked up further orders to produce the TIE Fighter Pilot (14), Rebel Fleet Trooper (12), Death Star Gunner (12) and Rebel Pilot (20) helmets. As a side note, after Star Wars was completed Shepperton Design Studios went on to work on Alien (for which they produced a semi-translucent alien which was sadly never used for the movie) Superman, Space 1999 and the cult Smash martian robots. The original license for replica Star Wars helmets was granted to Don Post Studios in 1977. Their worldwide license covered vinyl and plastic helmets of the pull-over variety and not the simple, one-piece Halloween-style masks that retailed for much less. In the 22 years that Don Post Studios held their license (1977 to1999) there were three types of Stormtrooper helmets produced - Standard, Deluxe and Classic Action. The first Stormtrooper Standard helmet to be released was in 1977 for $39.95, with a revised version with clear lenses in 1978. Several re-releases of the 1978 helmet were issued between 1988 and 1990, each having slight changes to make them unique. Says Steve Sansweet in his "Price Guide to Worldwide Star Wars Collectibles": Stormtrooper helmets were injection-molded in heavy PVC plastic with dark lenses in 1977. The Twentieth Century Fox copyright was molded on the back of the helmet. They were revised in '79 with lighter PVC plastic, and had clear lenses. The lenses were glued in on both versions. The third version of the Stormtrooper mask, first produced in 1988, was a slightly different shape, because new plastic used reacted to the mold differently. The eyes were no longer separate pieces of smoky-colored plastic, and were painted black with many holes drilled for vision. The 1989-90 version replaced the foam band around the front of the helmet with a molded-in piece. All variations of the Stormtrooper mask have a tendency to yellow with age, as a result of the plastic used. A new 1994-96 version of the mask will show the LFL copyright, and will once again have clear plastic eye lenses." The Don Post Studios limited edition (with only 1000 made worldwide) Deluxe Stormtrooper helmets released in 1996 retailed between $600 - $750. They were moulded from fibreglass as a single pieces, making them very robust, extremely heavy and almost too uncomfortable to wear as a costume piece. These Deluxe helmets have a reflective symmetry (meaning that the left side is a mirror of the right side) to them that the screen-used helmets didn't have. The commonly accepted explanation is that Don Post Studios made a mould from one half of the helmet loaned out by Lucasfilm Ltd, and then used a rotoscope to copy this half to make the other side. Whether this is true or not is is unclear. Released at the same time as the Deluxe version, the Classic Action Stormtrooper helmet used the same mould as it's more expensive brother but was moulded from vinyl and constructed as a two piece helmet. This is one of the most popular costume pieces and can still be found being sold on the retail market because it is less costly, is lighter and came fitted with foam padding. Steve Altmann, an exotic armour builder from Australia and owner of Altmann's Armour, held the exclusive license for replica Star Wars helmets in Australia and New Zealand between 1996 and 2002, during which time 13 different designs were cast and moulded - including the Stormtrooper. There were two Stormtrooper helmets issued by Altmann's - the Limited Edition and the Standard versions. Both were made from high-impact plastic, and despite large inaccuracies in scale and detail they are considered to be better quality than the Standard Don Post Studios helmets. Altmann's first Stormtrooper product was released in 1996 as a Limited Edition of 500 helmets; each having a numbered sticker on the inside. In 1998 the helmet was re-released using the same mould as a non-numbered Standard helmet. The current replica helmet license is held by Rubies, who took up the license in 2000 after Don Post Studios cancelled theirs. In doing so Rubies also received the helmet moulds from Don Post Studios and began to cast off these instead of making their own. While Rubies has mostly concentrated on Prequel Trilogy helmet designs they have produced 6 classic helmets - including the last Standard Stormtrooper helmet produced by Don Post Studios (1994-96). Prop replica collector's and Stormtrooper armour enthusiasts were critical of the Rubies release, as it did not address any of the flaws inherent in the Don Post Studios original. In 2003 the original moulds were discovered to still be in the possession of Shepperton Design Studios, and original Star Wars helmet maker Ainsworth began production on a limited run of Stunt Trooper helmets. Rather than create idealised Stormtrooper helmets Shepperton Design Studios produced theirs to closely resemble the original generation of screen-used helmets made in the early months of 1976. For more information on this helmet read our detailed Stunt Trooper helmet review. Future inclusions in the Shepperton Design Studios line include the Imperial Pilot and Hero Trooper helmets. Numerous other companies around the world held licenses in order to fill in merchandising gaps, and most produced Stormtrooper helmets and masks to different standards of quality. In the USA it was Ben Cooper who held the license for plastic face masks used for Halloween costumes. Their vinyl Stormtrooper mask was released in a Star Wars and The Empire Strikes Back window box in 1977 and 1980. The Japanese license was held by Ogawa-Gomu Co. who made a rubber pull-over mask, as did Cesar in France. In Mexico Papeles Troquelados produced a paper cut-out mask of the Stormtrooper while Creaciones Juanin held the license to produce plastic masks similar to Ben Cooper. Props (pardon the pun) goes out to the following: Jez (Star Wars Helmets), Brandon Alinger (Replica Prop Forums), Andrew Ainsworth (Shepperton Design Studio) and Steve Altmann of Altmann's Armour). These helmets are intended to be collectible pieces and should never be used as protective clothing. Since this article was written Shepperton Design Studios has successfully been sued by Lucasfilm for unfair competition, as well as copyright and trademark infringement, making claims Andrew Ainsworths involvement in the genesis of the stormtrooper helmet questionable. You can read the outcome of the court case for more details.